This event is open to all Explorer Scouts aged 15 and over, Scout Network and Leaders from all Sections within the County. For the younger members, they’ll get to learn the basic skills and experience Scottish Winters with overnights out in the wilds and the social crack on a residential. For older members, there’ll be opportunities to develop your skills to be self-sufficient in the mountains, understand the risks and grow experience in a controlled environment. Those with more experience will be able to hone their skills further, obtain permits and in so doing benefit scouting. We will once again be using Rothiemurchus Lodge near Aviemore in the heart of the Scottish Highlands which gives us great access to the mountains, both in the nearby Cairngorms and further afield. Please note the event is running from Friday evening to Wednesday morning of February half term, ie 4 days of activity, then drive home Wednesday morning arriving back in Lancashire mid afternoon. We will be communicating with you by email this year (not text) so make sure you give us an email address that works and that you regularly check. We will be in the “Union Jack Lodge” of Rothiemurchus Lodge in Glen More based in the Cairngorm area of Scotland. This is typical group accommodation with a bunk bed rooms for 4-6 people, large dining area, comfy lounge, bar/games room and dedicated catering kitchen. Anyone from the County, ie Explorer Scouts, Network and Leaders wishing to develop their own skills, gain more experience or simply have a fun four days in the mountains will be very welcome. The Scottish Winters can be quite demanding and the distances that we generally are walking means that any participant should be reasonably fit, at a minimum have hillwalking experience, and is capable of several active days in the hills. There is a minimum age of 15 for Explorer Scouts due to the maturity and stamina required in the Scottish hills in winter. We also liase with your Explorer Scout leader to check that you have the experience to have a rewarding holiday. Many participants are Network members and Leaders who want to develop their skills further and enjoy a few days in the hills with like minded people. The plan is for everyone to travel up in Minibuses – leaving the County by 18.00hrs on the Friday, earlier if possible. This should get us to Aviemore just before 11pm. We usually take four or five minibuses. Pick up points to be arranged once we know who’s coming. Return will be on Wednesday with arrival in Lancashire mid to late afternoon. Drop off will probably be in the Preston area. All times & pick-ups will be confirmed two weeks before the event via email and/or the website. All specialist equipment hire is included in the price. We will issue you with Ice axe and crampons (and show you how to use them!). We have a stock of winter Boots, waterproof tops and waterproof trousers we can lend you. Ideally request these in advance when you apply. If you want to use your own, we will check them and if we believe your equipment is not suitable or robust enough we will lend you something more appropriate. Your waterproof top should have taped seams and a stiffened hood. Your walking boots should be “B2” grade as a minimum. If you are going to borrow our boots, it can be a good idea to bring your own summer boots for low level walking. Your base layers and fleece layers should be polyester type, not cotton. There is a more detailed kit list on the website. This is NOT a “formal” training course and participants can very much choose their activities, apart from the first day when, for safety purposes, everyone does a winter skills day either for the first time or as a refresher. In the evenings there will be opportunities for further discussion and training, or just to have a good crack in the bar. All are welcome in the bar but we very strict on alcohol is for over 18’s only. There will also be an opportunity for higher level permit assessments, though please email us beforehand. Over 18 Rules may be applied if required although, because you are participating in an organised event, we reserve the right to ask you to modify your intentions on the grounds of safety. 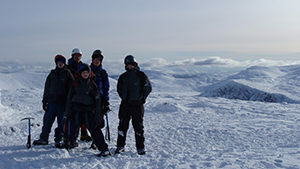 The core activities are winter mountain skills, winter hillwalking and self led low level expeditions. In addition we endeavour to offer winter climbing, snowholing, down hill skiing and cross country skiing as introductory activities and we have many years of introducing these to Explorer Scouts and Network. These are very dependent on snow conditions, weather, your capabilities, the available leaders and their permits and may not happen or may need to be rationed. A team of experienced mountain leaders with backgrounds in Winter, Alpine mountaineering and Arctic Expeditions will be available for instruction, leadership and mountain supervision. Because of the potentially serious nature of some of the activities, everybody must agree to comply with any “recommendations” (instructions!) given. We again expect Andy Brown MIC BASI, a professional Mountaineering Insctructor (MIC qualification) to be with us to support the organisers and leaders in their planning and decision making. This event is an all-in package – bunk accommodation, transport and food (haute cuisine from Aunty Bob and team). We provide from the time you arrive to when you depart. Nosh-stops will be made on the journey and we suggest you supplement our packed lunches with a few of your own hi-energy food, cereal bars, Mars bars, etc. The cost of the event is £270. These costs are inclusive of accommodation, transport, food and equipment Some activities may additional charges for equipment hire eg mountain biking, downhill skiing and cross country skiing. We are using an online application process, so you can use the link below to apply, then you’ll be e-mailed bank details for your deposit payment. The opening date is 1st October and it will be on a first come, first served basis If you are unsuccessful in your application we will refund your payment. The two main reasons for an unsuccessful application are inadequate experience and the event being full, in which case we will notify you and give you the option of being on the waiting list. Cancellation policy? We don’t have one. It largely depends on whether we have filled the event and how much you have paid. Get in touch as soon as possible and we will talk but we cannot promise anything. If you have any questions, or want advice before buying any gear feel free to email us and include a phone number. We’re happy to talk to Explorer Scout’s parents to answer any queries they may have, especially prior to spending hard earned money.